The former Secretary General of the Southwest Elite Association, SWELA, Napoleon Besong Nyake, who hails from Kupe Muanenguba Division, has urged elites of the Division to all rally behind one of theirs, Prof Elvis Ngolle Ngolle, who, in the September 22 cabinet reshuffle, was appointed Minister of Forests and Wildlife. 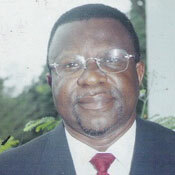 Nyake, who made the call in a chat with The Post in Douala on September 25, said the appointment of Ngolle Ngolle as a full-fledged Minister, after serving as Minister of Special Duties for several years, is a pride to Kupe Muaneguba Division in particular and the Southwest Province in general. He explained that it is an obligation for Kupe Muanenguba elites - at home and abroad - to more than ever before nurture a spirit of solidarity and unity of purpose, in support of the Minister so that Ngolle Ngolle can succeed in his exalting mission. The erstwhile SWELA scribe vehemently condemned the attitude of some elite who are spending time trying to backstab one of theirs who has just been appointed to such a high post of responsibility. He noted that petition writing, blackmail or scheming to destroy a brother in a post of responsibility out of jealousy or for whatever reason, is not only a vicious act, but mean as well. As for the appointment of Ngolle Ngolle, Nyake regretted that some little minds or detractors are already saying that his appointment as Minister of Forests and Wildlife, is a way out for him. These detractors, Nyake said, are even talking of when he would be sacked from Government. Nyake, however, recalled that, when Prof Ngolle Ngolle was Minister of Special Duties, the same detractors had sworn he would never rise to a full-fledged Minister. Nyake, who would not say if the detractors are natives of Kupe Muanenguba Division, stated that the appointment of a Minister is the discretion of President Biya. Reiterating the need for all Kupe Muanenguba elite to rally in support of their brother in Government, Nyake stressed that they must, together, strive to make positive use of this opportunity that President Biya has given the Division. "Even if our brother happens to err, as is likely to happen to any human being once in a while, it is for our interest to correct him. We should strive to think positively. Negative criticisms will not take us anywhere". Nyake appealed to all Kupe Muanenguba sons and daughters to bury whatever differences they might have and "all rally behind our brother in Government for the interest of our beloved Division." Meanwhile, rejoicing at the September 22 appointment of Prof Ngolle Ngolle, Nyake expressed the conviction that Ngolle Ngolle's appointment was a compensation for his loyal services to the President, Government and the State, over the years. "It is indisputable that Prof Ngolle Ngolle has, all along, been very consistent in his services". At another level, Nyake saw the appointment as compensation to Kupe Muanenguba Division, for its loyalty both to the CPDM, the party in power, as well as loyalty to State institutions. He pointed out that election results, over the years, have established the fact that Kupe Muanenguba Division is a CPDM strong hold. Nyake, who, with other elite from Kupe Muanenguba, rushed to Yaounde, after the September 22 appointment, to congratulate Ngolle Ngolle, said the entire Kupe Muanenguba is very grateful to President Biya for the precious gift of a full-fledged ministerial post to their Division. The Post gathered that several Yaounde based Kupe Muanenguba sons and daughters, in a spontaneous reaction to the appointment of Prof Ngolle Ngolle, swarmed his residence at 'Quartier General', on that September 22, to rejoice as well as reaffirm their solidarity with their kinsman. Some of the Kupe Muanenguba elite, who were spotted rejoicing and merry making, at Ngolle Ngolle's residence that evening included Hon Albert Ngome Kome (former Minister), Chief Justice Epuli, Prof Charles Epie Alobwede, Prof Paul Ndue, Paul Eulong, among many others. A number of friends and well wishers, who hail from other parts of the country joined the celebration, among them, several personalities like Dr Peter Abety (former Minister and current GCE Board Chairman) and Victor Arrey Mengot, the newly appointed Minister of Special Duties at the Presidency. On his part, Walter Messumbe, Ngolle Ngolle's Private Secretary, told The Post that, the September 22 appointment is, indisputably, a reward for his selfless service to the nation. He was full of praises for Prof Ngolle Ngolle's "strong spirit of hard work, patriotism, tolerance, understanding, duty consciousness, patience, peace, sacrifice and love for humanity. Why are leaders and politicians of la republique always telling people to rally behind someone because he has been appointed from their region? Government traditionally is for the people and if someone is appointed from a region, he is appointed to work for the entire nation. Thus his historical heritage should'nt be an issue. I dont really understand what is wrong with La Republique's leaders. Massa Prov Elvis, na your time, even me I suport you. But you are so calm to be send to the forest, you are so gentle be in the wildlife, you more qualified to be apointed as a forest guard, anyway how man go do. I how apointed you as the Minister Finance, if my cabinet member querell me, then we shall send you to the ministry of trade and Industry. Forest Guard should be too far from you Papa. Erstwhile Minister for CNU/CPDM Junta,aka, Special duties at the presideny,has been upgraded to a fully fledge Minister of Forest, Fauna and Antelope while Mr Victor Arrey Mengot steps in as the new Minister for the Party.This has been greeted by wild jubiliating from close friends family members and some close polit rambos of the junta. This man has been in gov't for quite a while.As a South west elite, can he explain to all the south west people and all Cameroonians why the there are no roads linking Mamfe and Bamenda,no good roads from Muea to Kumba,and Mamfe Kumba? This is hugely disappointing.Sometimes it is better to for these people to stop playing dirty political games by claiming to be elites when infact they are just hollow figure heads who sit back and enrich their families and a few tribal links. The main focus of South west elites is not to appear to be leaders with high sounding titles like Chief and Professor or Doctors.We need you guys to be honest a tell us what is stopping you from telling us why these roads are all wrapped in political lies only when elections are nigh. Chief Tabe Tando , Pro.Ngole , i think you guys are a disgrace.You need to prove that you can over come the challenge of providing good roads for your people and not sit there in gov't contented that you being compensated for being a chief or professor.Threatening and conspiring against people who speak the truth is very undemocratic. We are still watching you guys. Fact 1: All ministers are appointed. They are answerable to the person who appointed them.They stay in office for as long as he finds no particular reason, including no reason at all, to throw them out. Fact 2: Cameroon has one of the highest turnovers as far as appointment of ministers is concerned. Exceptions notwithstanding, the average tenure is 6 (I mean six) months. Fact 3: Since ministers are not elected, they are not accountable to any constituency. Sorry, that is wrong: they have a one-man constituency: the person appointing. a)Efficiency and dedication to duty are not a primary concern (Remember Sanda Oumarou at P and T). Satisfaction of the person appointing is an overall priority. b)Satisfying the appointing authority and resolving the problems of any other constituency do not necessarily amount to the same thing. The question is why rejoice when life expectancy as minister is in any and every sense one of the shortest on earth? Why rejoice when performing the duty for which one is appointed may lead to his or her ouster from government in the shortest possible time? Why rejoice when, as a result of the brevity of tenure, one is constantly plagued by the anxiety of dismissal? There is no relationship between a minister's appointed and a rapid improvement in reconstruction and developmental projects in areas where the minister hails.I see no reason why families,friends and welwishers jubilate after a cabinet appointment.This is hypocrisy indeed.The Biya's regime compensates only those who are 'loyal' to the thievery and corruption practices within the La Republique. The only reason why families get to dine and wine is because they have someone who can represent them in aggrandissement and amassing wealth for their family.If Mr Besong Nyake is asking the whole of Kupe Muanenguba to support Ngole Ngole in the government,then he should just put it in simple terms 'support president Paul Biya and the CPDM in the upcoming elections'.We all know this is politics.Don't fool the masses for self-enrichment while majority go poor and poor everyday at the expense of the favored and lucky few.